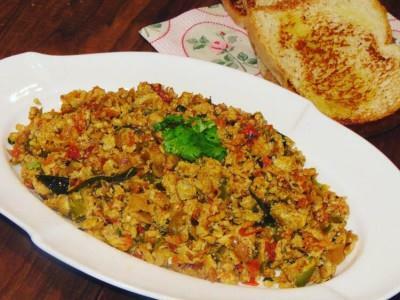 Egg Bhurji is a scrambled eggs but in Indian style.my favorite among all the eggetarians, scrambled eggs are easy to make. Fried and tossed with some spices, learn to make it the way thy make it on Indian streets! 2 medium tomatos chopped fine. 3 green chilli peppers slit lengthwise. 1 teaspoon red chilli powder. In a large bowl, whisk the eggs using a spoon and keep aside. Take a pan, add oil and heat. Now add jeera , onions, green chilies, curry leaves, capsicum and ginger. Sauté for few minutes..
Add tomatoes and few coriander leaves. Sauté for a minutes. Add 1tbsp butter, pav bhaji masala, red chili powder, turmeric powder and salt as per taste. Mix well. Lastly, pour in the slightly beaten eggs and keep whisking until cooked. Top it up with butter. Garnish with the remaining coriander leaves. Serve hot with buttered bread.